We had an amazing turnout for our Robotics Hackathon November 14-16, 2014! 75 participants in 19 different teams built robots for an entire weekend. Our theme this year was “Positronic: Robots and Brains” and teams were challenged to come up with a robot related to this this theme in some way. Special prizes were awarded for robots that addressed the challenges of aging at home and coping with dementia and there was an incredible number of creative solutions to this problem. 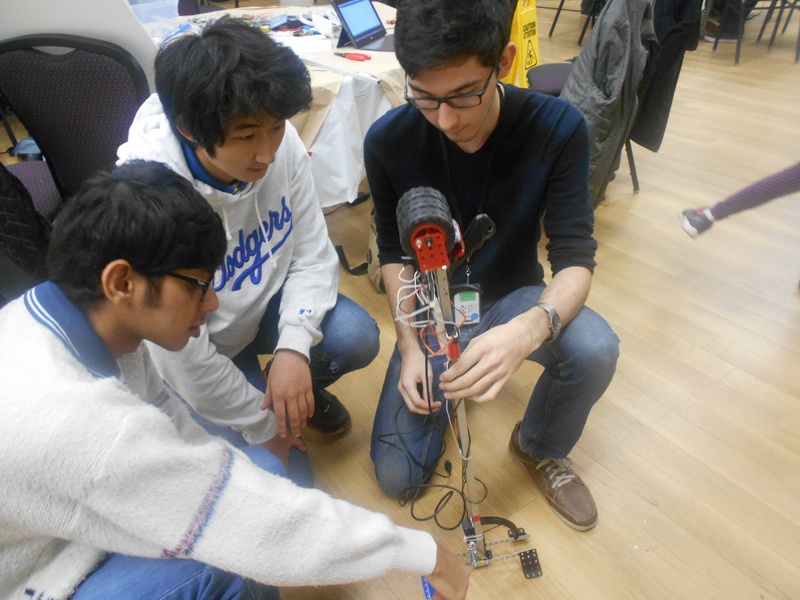 Each team was given a kit of technology including a microcontroller, sensors, motors and electronic parts. XYZ Interactive donated one of their GestureSense sensors for each kit, technology not yet available on the market but soon to be released for makers to integrate into their inventions. Our sponsor Meccano provided their model kits for the robot chassis. Their kits gave our robohackers a platform to build their robot on. The teams were resourceful, merging Meccano, craft materials and 3D printed parts into smart pets that help the elderly, futuristic robotic arms, one team even converted a piñata into a robotic pill dispenser. We had a stellar panel of guest judges. Our special thanks to Sabrina Greupner, Manager of the Weston Family Innovation Centre at the Ontario Science Centre, Alex Mihailidis and Rosalie Wang from IATSL, Professor Norman T. White from the Radio Television Arts Department of Ryerson University, Nick Pagee Curator of the TIFF Kids Digi Play Space, and Ziya Tong from Discovery Channel’s Daily Planet! Judges Sabrina Greupner, Norman White, and Nick Pagee. 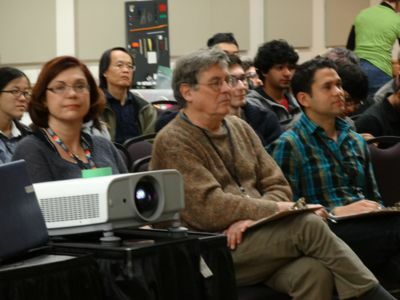 Judges Rosalie Wang, Alex Mihailidis, and Ziya Tong. This year we introduced two new categories of robohackers: corporate teams and family teams. Our Corporate Innovation Challenge invited corporations to send teams of employees with diverse skills and backgrounds to work together for the weekend. Autodesk and Manulife sent teams to participate in the Challenge. Both teams transformed their ideas into working prototypes in just one weekend while developing their team-building and innovation skills. 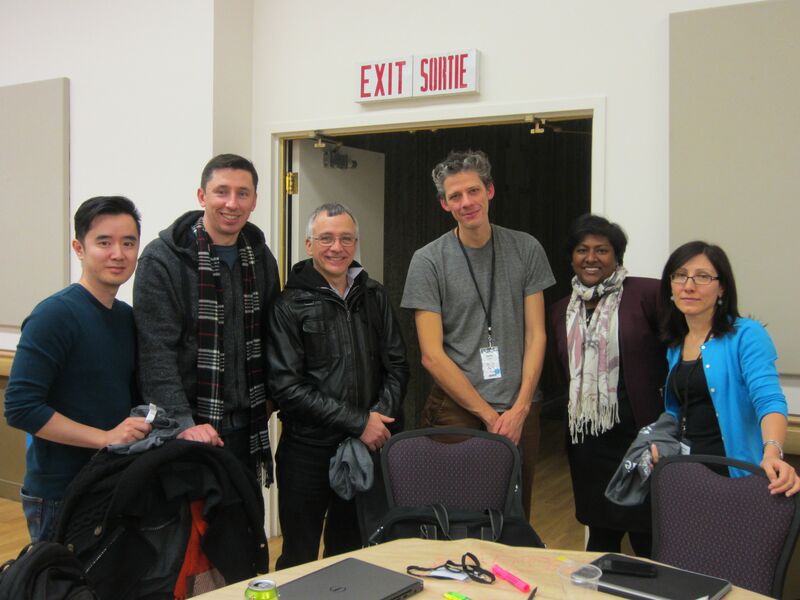 We would like to thank Autodesk and Manulife for being part of our robohacking weekend. Team Manulife hard at work. For the first time at Get Your Bot On! four family teams took part. The junior robohackers inspired everyone with their creativity and their hard work. Our family category winners, Team Z, built Tom and Jerry, an impressive bot that integrated GestureSense’s sensor and computer vision technology to support an ageing population. Team Z took home the Family Prize sponsored by Mimetics Canada. 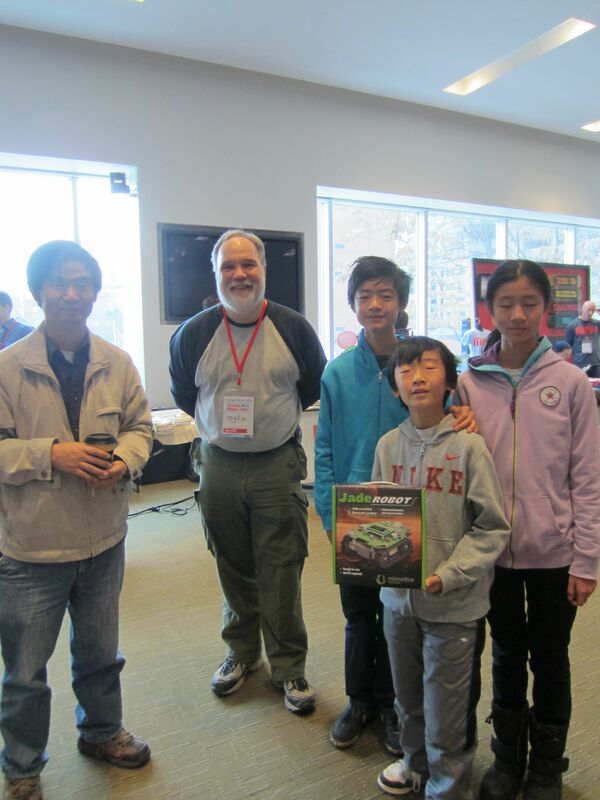 Mimetics donated one of their Jade Robots and a half-day robotics workshop for the team and their friends or school. The judges had the very difficult task of awarding a total of five prizes to teams who produced the most innovative robots to improve the lives of the elderly. It was an extremely tight competition — there were so many excellent robot ideas!! Instagramma won the Design for Human Interaction prize. Instagramma is an easy simple solution for grandchildren to share pictures with their grandparents. The team focussed on making pictures easy to share and print out to bridge the technology gap for the elderly. Meccano donated premium modelling kits for the category prize. Team Instagramma in the early stages of design. 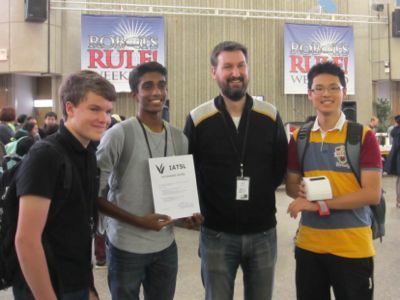 The GrabBot won the prize for Technical Excellence with their robotic arm for game play. The robotic arm used gesture recognition technology to allow the elderly to play games such as chess more easily if they have mobility issues or to play at a distance. Linxee Wireless donated three of their LED smart bulb kits as the prize for the category. Team GrabBot showing off their robot at the Toronto Mini Maker Faire. One of our student engineering teams from the Engineering program at York University’s Lassonde School of Engineering won the Innovation category for their SmartCane self-balancing cane for the elderly. The team received a Site 3 Laser Workshop and $50 Active Surplus Gift Certificate to continue their innovative work. 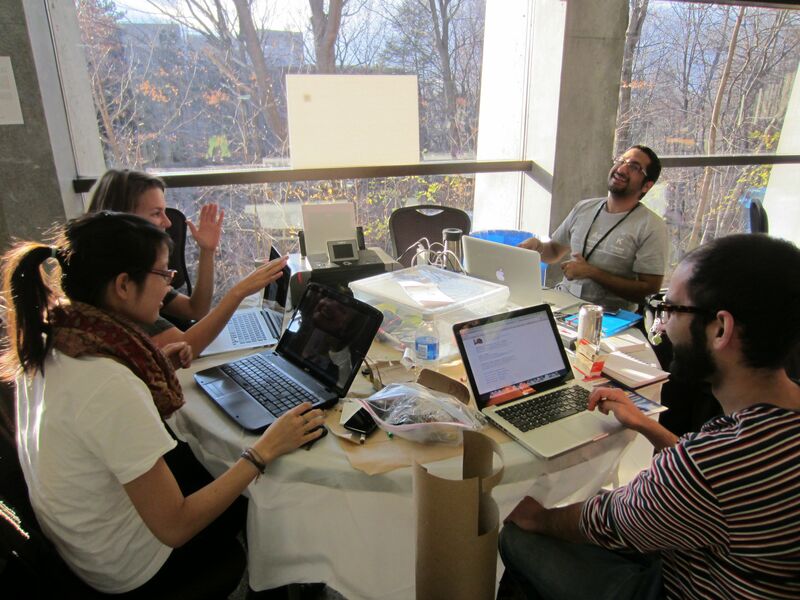 We were thrilled to have two teams from the Lassonde School participate this year! The Lassonde team working on their SmartCane. The competition was very tight for our main hackathon categories and the judges had a difficult time selecting winners. The Snakes on the Brain robot was selected as the runner up. The snake is an interactive therapy robot that administers melodic intonation therapy for stroke patients. It helps them retrain the portion of their brain that allows them to sing so they can regain their ability to communicate. 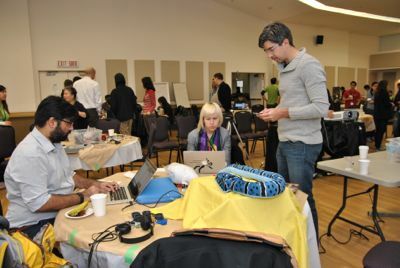 The team making final adjustments to their robot Snakes on a Brain. Finally the Internship Prize at the IATSL lab went to our high school team FRC610 for their armband alert system, web medication management, and video monitoring tool for families coping with dementia. This amazing team of 9th graders created aWatch and were awarded a $5000 internship at the Intelligence Assistive Technology and Systems Lab (IATSL). 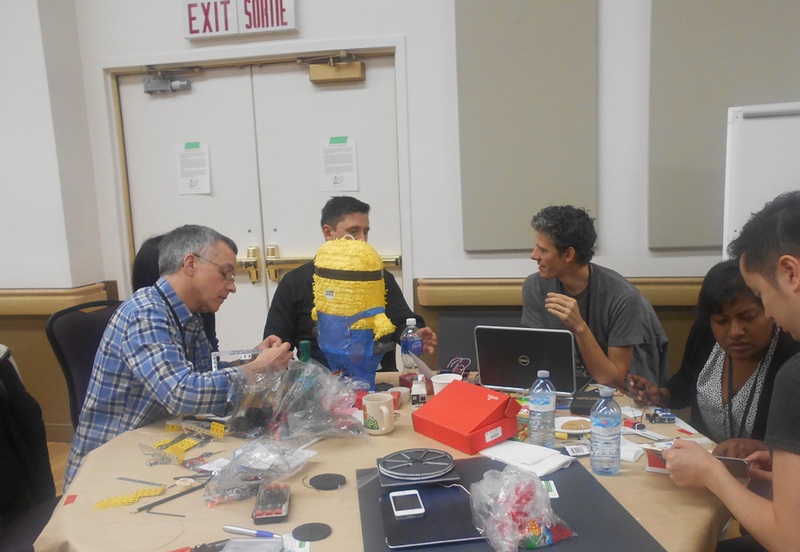 At the IATSL, they get to work with a team of scholars to develop their prototype beyond the GYBO2014! weekend. 9th Grade students from Crescent School with Alex Mihailidis of the IATSL. Thank you to the Ontario Science Centre for letting us be part of the “Robots Rule!” weekend! Our teams thoroughly enjoyed themselves and were inspired by your creative space. Thank you also to all of our participants. You amazed us with your creative robohacking and innovative ideas for supporting an ageing society. Finally, we are extremely grateful to the team of volunteers and mentors whose dedication made GYBO2014! possible. The organizers would like to thank all our sponsors and community partners that helped make #GYBO2014 possible. 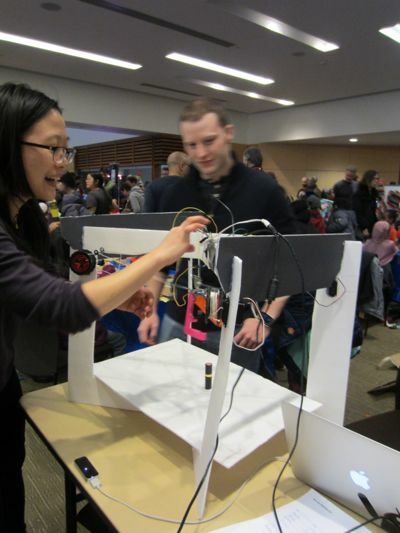 Thanks to the Ontario Science Centre, IATSL, Autodesk, Meccano, XYZ Interactive, Mimetics Canada, Conveyor Built, InteraXon, Sparkfun, Site 3, Active Surplus, Linxee Wireless, Semaphore Lab, Makelab, Uniiverse, Toronto Mini MakerFaire and the Lassonde School of Engineering at York. We couldn’t have done it without you. ← Day Two, Building and Testing. So Many Ideas!